The check-in print settings can be customized to fit the needs of your organization. For example, you may want to print labels for some classes and not for others. The devices you use such as a PC, Surface tablet, iPad, etc. and whether or not you are hosted or self-hosted can determine how best to configure your print settings. If you are hosted, meaning we host your data and website for you, then it is best to have printers connected to your PC devices to print Check-In labels. If you are self-hosted, meaning you have a server on site that hosts your Arena data, then you have the option to use the CheckInPrintFromServer feature. This feature is used for printing labels through your server to any printer that has been connected to that server. This feature must be used in order to print from non-PC type devices such as an iPad or Android tablet. 1. 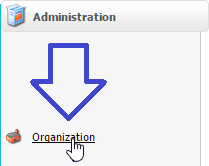 From Administration menu, select the Organization option. 2. Scroll down and then select the CheckInPrintFromServer link. 3. Enter either "false" or "true" in the Value field and then click the Update button. The CheckinPrintFromServer setting controls where print jobs originate. When the setting is set to “false”, each kiosk creates the print job for each label and prints it to an attached printer. •When using PC devices with USB label printers as your check-in kiosks, then you will keep the default setting of “false” for the CheckinPrintFromServer organization setting. 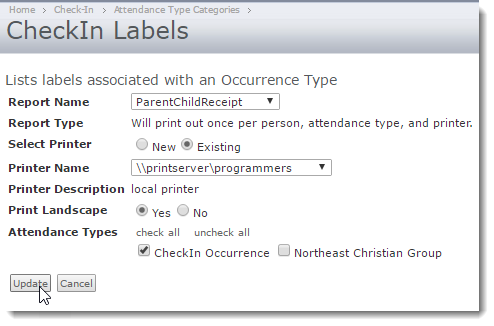 •When CheckinPrintFromServer is set to “false” you can also use non-PC devices to check in as long as the attendance type does not need to print labels. When the setting is set to “true”, the web server creates the print job for each label and sends it to a network printer. •If using network based label printers because you want or need to print from any on-domain, non-PC device’s web browser (e.g. iPad, Mac, Android, etc.) then set CheckinPrintFromServer to “true”. This setting applies to all kiosks. 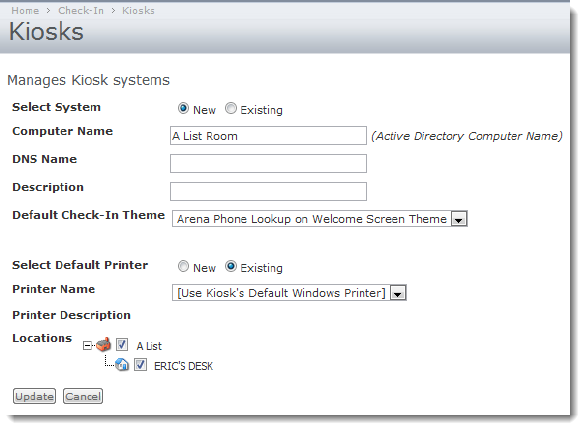 •The check-in application can also print to network devices when CheckinPrintFromServer is “true”. However, the check-in application most commonly uses a locally connected label printer. 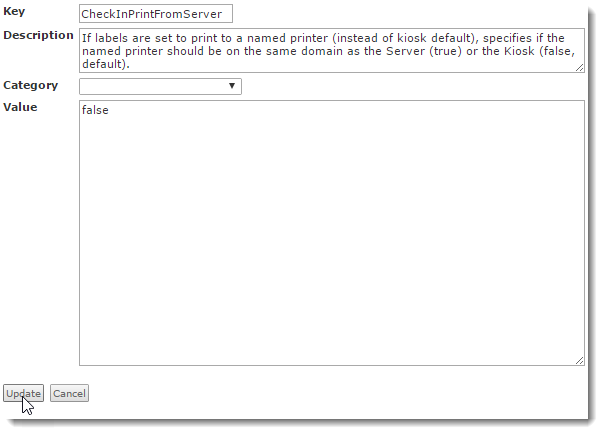 •CheckinPrintFromServer “true” only allows on-domain printing. While check-in itself will work off-domain via a web browser, label printing is not possible off-domain using the print from server option. •The most common reason to use CheckinPrintFromServer “true” option is the need to print check-in labels from an iPad, since direct printing to a locally connect label printer via the check-in application is not possible. •The check-in application can only be loaded on Windows OS devices such as a PC or Windows tablet because IE and .NET are required to install and launch the application. NOTE: When using Print from Server organization setting, the printer must be installed on the web server. 1. 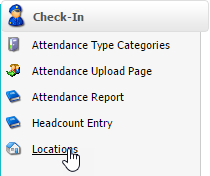 From the Check-In menu, select Attendance Type Categories option. 2. 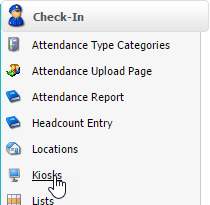 Next, click the Labels link for the appropriate attendance category. 3. Click the Add link. 4. 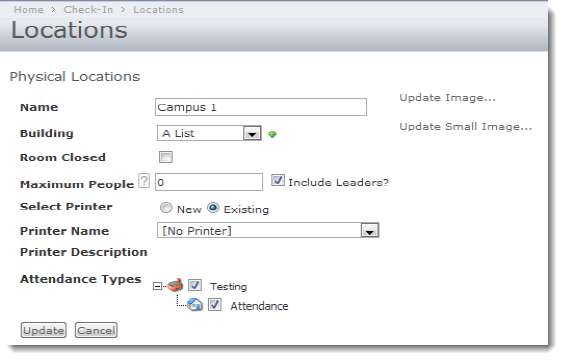 Specify the Report Name, Printer Name, and Attendance Types and then click the Update button when you are finished. 1. From the Check-In menu, select the Locations link. 2. Choose the correct location for the occurrence under Locations. This option is only used for printing in different locations. 1. From the Check-In menu, select the Kiosks link. 2. Click the Add New Kiosk icon and then enter your kiosk information. Click the Update button when you are finished. NOTE: The Check-In application only works in IE. Checking in from URL is supporting by IE, Firefox, Chrome, and Safari browsers.